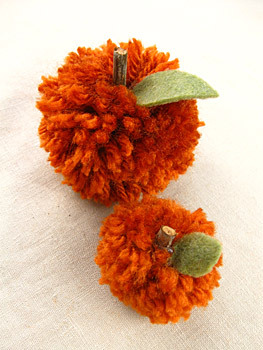 I first made these pom pom pumpkins last year when I did the flowers, but by the time I posted the pom pom flower tutorial I felt that it was probably too late in the season for the pumpkins, so here they are this year! They make cute little accessories for bookshelves and other nooks and crannies, and I think that they’d look nice coupled with a table place card at a fall themed wedding or Thanksgiving dinner, as well. 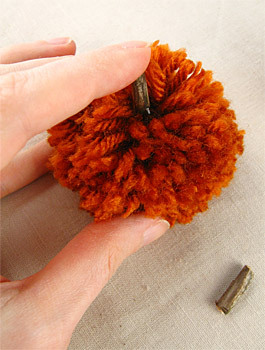 Plus, they’re very easy to make, so you can have a whole patch full of pom pom pumpkins in no time! 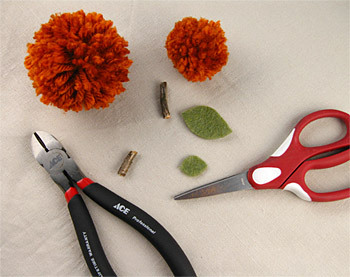 Using the wire cutters, cut short pieces of the twig (1/2 to 1 inch) for the pumpkin stems. Cut leaf shapes from the felt. I just folded a rectangle of felt in half and cut a semi-oval shape, trimming afterward if necessary to get the shape that I wanted, but you could also make a more realistic looking pumpkin leaf. Clear a place on the pumpkin that looks good for the stem. Look for a spot where there’s a good mass of yarn to, so you’ll be able to anchor the stem well and be able to fluff the yarn around it afterward to hide any imperfections. 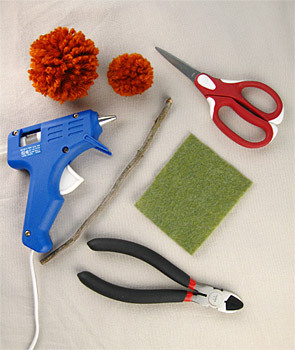 Add hot glue to the end of the twig and insert it into the pom pom, holding for a few seconds until the glue is set. Take one of your leaves and add a little hot glue to one end. Place the leaf, glue side down, beside the twig stem in the cleared area of the pom pom and put light pressure on the glued end for a few seconds until the glue is set. 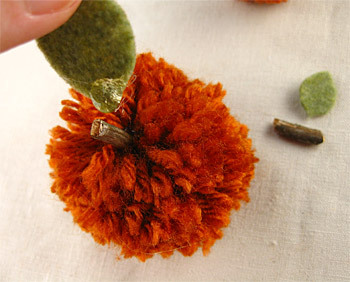 Clean up any glue-y strings and fluff the yarn around the stem and leaf. 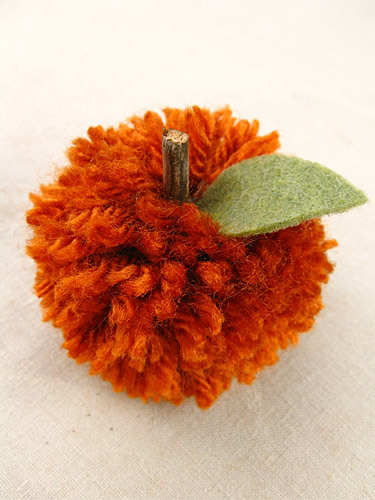 You now have a cute pom pom pumpkin decoration! These are so cute. I love the purple ones you did earlier! Very cute. I’m going to add this one to my pumpkin craft round up. I love these! And I even have a bunch of orange yarn left over from knitting pumpkin hats! How sweet. Really cute! Love the little twig-stem especially. These are SO cute! Thanks so much for the how-to, I’ll be linking…and hopefully making a big bowlful myself! May I just say that this blog is one of the most amazing that I have come across!! thank you so much for all your helpful cooking and craftyness!!! I made these tonight but in red to make apples. Thanks for the instructions. They turned out great. My six year old daughter is going to be a apple tree for her school Halloween costume tomorrow and I wanted some apples to put in her pig tails. I used black ribbons to tie them up with and left the pieces long to tie the pom poms in her hair. What a cute craft! I have grandkids visiting next weekend! Adding this to my craft plans for “Grammy Camp!” Thank you! Rosemary, what a great idea to make apples! And Marcia, I do think this would be a good one for “Grammy Camp”. Love that! I’ll have to try it for next year, and perhaps even attach them to little boxes when I give sweets and cookies to my friends! this is great I love it! I linked to it in my link party on my blog. Love this so much I had to feature it!